DENNIS TUBBERGEN has been working in the financial industry for over 25 years. 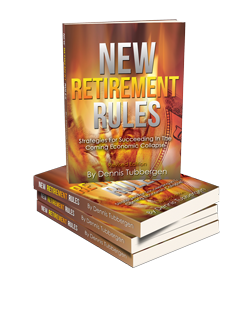 Dennis Tubbergen has authored four books for consumers: New Retirement Rules: Strategies for Succeeding in the Coming Economic Collapse, Finding Financial Freedom, Economic Consequences: Can You Survive, Even Prosper, From 100 Years of Bad Money Decisions, and The Retirement Resolution. Mr. Tubbergen also authors a weekly newsletter titled “Portfolio Watch”. Mr. Tubbergen is now in his tenth year of financial talk radio and currently hosts the syndicated program The Everything Financial Radio Show. The Everything Financial Radio Show airs weekly and hosts numerous guests with expertise in the economics field. Mr. Tubbergen has also frequently been a featured and keynote speaker at many financial industry events. Mr. Tubbergen is a resident of West Michigan and is the proud father of 3 daughters.